Our Canadian summers are short and fleeting. Warm and sunny days are best spent enjoying the outdoors and connecting with nature. While you are out exploring nature’s wonders, you can also help control the spread of invasive species. 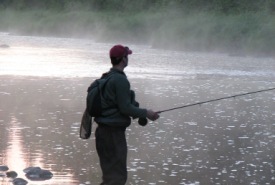 Activities such as camping, hiking, biking, fishing, boating, horseback riding and driving ATVs can unintentionally spread invasive species into our rivers, streams and forests. You may be familiar with some invasive species and be surprised at others. Invasive species do not naturally occur in Canada, and they have few natural predators to control them. Once they get into our ecosystems, they’re often able to spread and out-compete our native plants and animals. You may unknowingly contribute to the spread of invasive species into our parks and protected areas when enjoying the outdoors. That’s why it’s important to learn to recognize them and help minimize their spread to new areas in Canada. Here are the top 10 invasive species in Canada that can be spread through summer recreational activities. 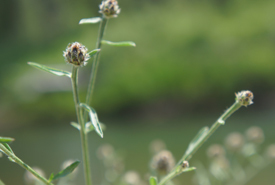 This aggressive invasive plant invades prairies, meadows and open woods. 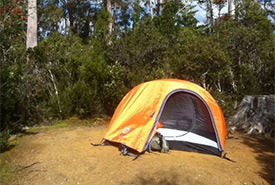 It can take over these habitats and reduce the number and diversity of native plants and animals. Each plant produces thousands of seeds that can be spread when they adhere to ATVs, horses, bikes, hiking boots and camping equipment. This biennial plant is rapidly spreading into forests and woodlands across Canada. It can form dense stands that exclude native plants, and can impact forest regeneration. 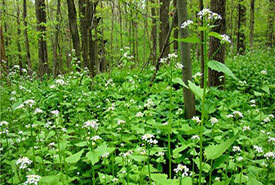 Garlic mustard can be spread when the small seeds adhere to boots and clothing. Known as the “zombie plant,” this aquatic weed grows quickly in the spring, forming a thick mass of tangled stems under water. 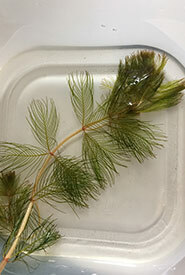 These stems get caught in boat propellers and rudders and reduce native aquatic plants and impact fish habitat. It is primarily spread when boats are moved between lakes. This small, bottom-dwelling invasive fish was found in the Great Lakes in 1990 and is spreading. 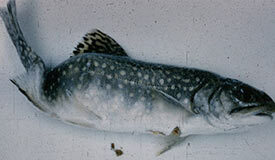 It reduces native fish populations by eating the eggs and young of species, such as lake trout and smallmouth bass. 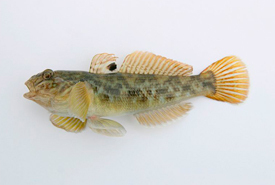 Round goby can be spread when it’s used as bait or when released upstream from dams and waterfalls. 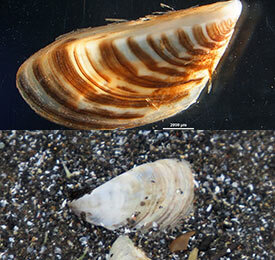 These small freshwater mussels are spreading across North America. They can completely cover the bottom of lakes, impacting fishes, native mussels and water quality. They are spread when they attach to boat hulls, trailers and motors and are moved between lakes. 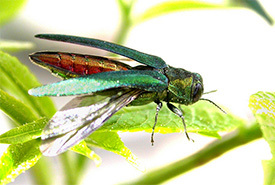 This non-native invasive beetle has decimated tens of millions of ash trees and continues to spread rapidly. It can quickly kill large areas of ash trees, impacting forests, areas along streams and rivers, and urban forests. It has spread to some areas by people moving firewood that has been cut from infected ash trees. 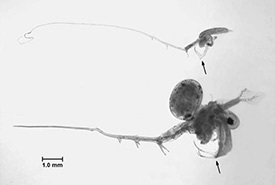 This small freshwater crustacean feeds on zooplankton in lakes. 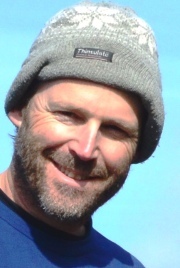 Spiny waterfleas can alter the food chain and impact native fish populations. Large numbers of spiny waterfleas form a jelly-like mass that clogs fishing gear and other equipment. This invader is spread when bait buckets are moved between lakes. Many people are surprised to hear that most of the earthworms they encounter are non-native and invasive, including the “night crawler” often found in gardens and used for bait. Invasive earthworms damage forests, as they change its soil chemistry and structure. 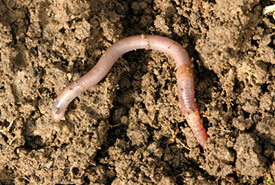 Earthworms can be introduced to forests by anglers dumping their leftover bait on land or in the water. Mud on vehicles can also transport earthworms or cocoons. This invasive parasite infects salmon and trout. First found in Canada in 2016 in Alberta, this disease invades the fish’s cartilage and impairs its nervous system, which causes it to swim in a whirling pattern. It can be spread by moving infected fishes, bait or boats between lakes and rivers. Domestic cats can have a significant impact on populations of migratory birds, reptiles and small mammals. They are considered one of the world’s 100 most invasive species. 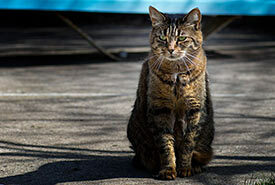 Cats that are brought to cottages and camps can kill birds and other wildlife of conservation concern. They should be kept indoors, or on a leash outside.